Home » Random » Apple’s left-right confusion? 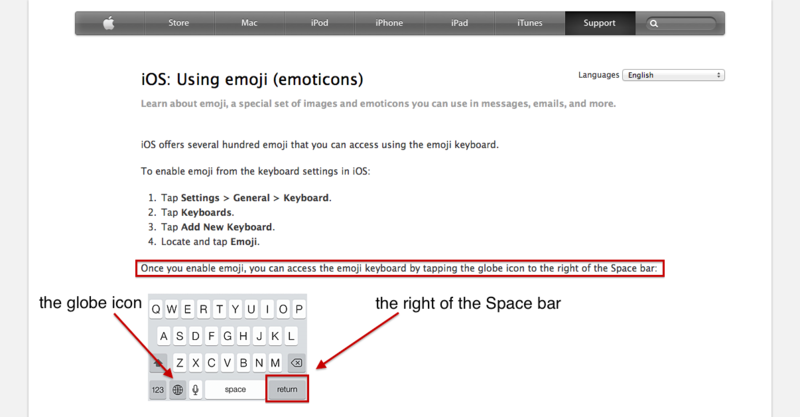 Some time ago I had to look up instructions on Apple’s website for activating the ’emoji’ emoticon set in my iPhone. When reading the instructions, I noticed a little mistake on their page. See the edited screenshot below to see what I mean. Apple has some unique ideas about left and right. I sent Apple some feedback on this error quite a long time ago. It was probably just a simple case of left-right confusion. But as of this writing, the error is still there. So not only does Apple not know left from right, it also appears Apple doesn’t really give a rat’s patooty about it either. Or is something deeper and more profound behind this? Interestingly, a fairly recent article suggests that women are more likely than men to suffer from left-right confusion (Hirnstein et al, 2009). It becomes even more intriguing when we consider that iOS is more popular among women than men. Fascinating! Anyone with left-right confusion is more likely to look for the globe icon on the left side of the space bar when instructed to look on the right side. So could it be that Apple’s ‘mistake’ is in fact a deliberate and fiendishly clever attempt to combine user-statistics with psychology? Probably not, but a fun thought nevertheless.